Montréal – Airports Council International (ACI) has released the latest edition of the World Airport Traffic Report. With comprehensive data coverage for almost 2,000 airports in 160 countries worldwide, ACI’s flagship publication remains the authoritative source and industry reference for the latest airport traffic data, rankings and trends on air transport demand. “With many major economies remaining in a fragile state, 2013 can best be characterized as a year of unstable recovery for the global economy,” said Angela Gittens, Director General of ACI World. “Despite this challenging operating climate, worldwide traffic surpassed the 6 billion passenger mark in 2013. This represents an enormous feat for the airport industry as we commemorate the 100th anniversary of commercial aviation in 2014. “The opportunities that lay ahead for aviation are numerous, particularly in emerging markets,” Gittens continued. “Indeed, the huge demographic bases in many of these economies, coupled with rising per-capita income, will mean continued growth at airports in these markets. The growth in air transport demand and the services that airports provide will have a beneficial multiplier effect within local economies where airports operate, as well as across industries and the global economy. Worldwide airport passenger numbers increased by 4.6% in 2013 to 6.3 billion, registering increases in all six regions. Atlanta (ATL) remains the busiest airport on the globe with 94.4 million passengers in 2013. Although traffic at the airport was down 1.1% over 2012, the second ranked Beijing (PEK), with 83.7 million passengers, experienced more subdued growth of 2.2% in 2013 as compared to the double-digit growth it achieved in previous years. Airport traffic in emerging markets and developing economies grew faster (8.7%) than in advanced countries (1.8%) in 2013, with emerging markets reaching a 42% share of global passenger traffic. With almost 1.3 billion passengers, BRICS countries (Brazil, Russia, India, China and South Africa), which represent 20% of global passenger traffic, achieved strong growth of 8.6% in passenger traffic. MINT countries (Mexico, Indonesia, Nigeria and Turkey) achieved similar traffic growth, with an 8.8% increase for passenger traffic in 2013. One of the fastest-growing airports among the world’s busiest is Dubai International (DXB), which moved from 10th to 7th position in 2013 as a result of its passenger traffic growing more than 15% during the year. Istanbul Atatürk Airport (IST, which ranks 18th) and Kuala Lumpur (KUL, which ranks 20th) are two other airports that experienced double-digit passenger growth rates in 2013, with increases of 13.7% and 19.1% respectively. The world’s top 30 airport cities handle more than one-third of global passenger traffic. London remains the world’s largest airport system with almost 140 million passengers handled at six airports. New York maintains the second position with 112 million passengers at three airports. Tokyo is the third city market with 105 million passengers. Worldwide airport cargo increased slightly by 0.9% in 2013 to 96 million metric tonnes, with mixed levels of growth across all six regions. 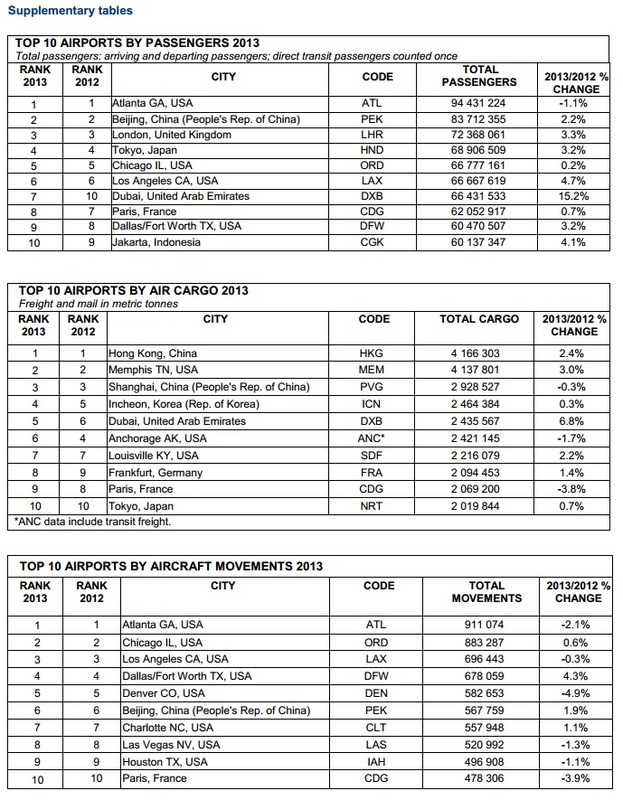 Hong Kong (HKG) and Memphis (MEM) take the first and second ranks respectively for the busiest air cargo airports. Each airport handled over 4 million metric tonnes in 2013. The world’s air cargo market is highly concentrated, with the top 30 air cargo hubs handling 57% of global air cargo volumes. Hong Kong and Memphis remain the busiest airports in terms of air cargo traffic (4.17 and 4.14 million metric tonnes of cargo respectively). The two Shanghai airports—PVG and SHA—handle 3.36 million tonnes combined, taking the third position in the air cargo hubs ranking. Worldwide aircraft movements increased slightly by 0.6% in 2013 to 82 million, with mixed levels of growth across all six regions. The rankings for the busiest airports by aircraft movements have remained unchanged. Atlanta (ATL) continues to occupy the top spot with eight of the ten airports in the rankings from the United States.